In this life full of pressure from many sides and aspects, sometimes we wish to have a temporary period to escape from reality. Hence, we can recover energy and nurture our remarkable characteristics. 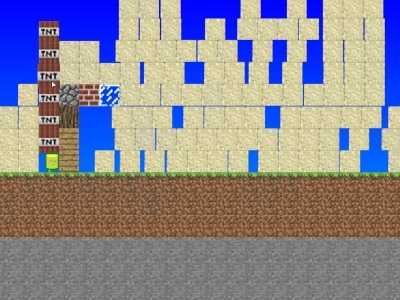 In Minecraft 2D, you will live in the mood of a little boy who first experiences a completely fresh world. Or if currently you are a kid, you can show how big the land of your imagination and creative is. With provided blocks, you select and use them to create something unusual and relaxing. You press one key which is in the list starting from Z to M on the keyboard and click in order to produce a types of block.